The photograph 'Not exactly as pictured' pictured on the home page of our website was taken about fifteen years ago, proving the old adage "fings ain't what they used to be!" The more realistic picture is quite recent. Terry is The Bloke, the one in the hat, and I'm The Wench! We traveled where ever the work took us and this often meant traveling either to BC or Saskatchewan. Most weekends found us a long way from home. community hall, the Banff Springs Hotel, or the stage at Lady Smith's Little Theatre, we've enjoyed every single minute of it. In 1995 we represented Alberta in Ottawa for the Canada Day celebrations, and we've also performed at the Calgary Exhibition and Stampede. We even did a couple of tours on Vancouver Island in the early 90's including two sold out nights at the Chemainus Theatre. We dreamed of one day living on the Island. The dream became reality in 2001and we chose Ladysmith as our home. We started looking around for a building we could make over into a theatre, and a friend suggested The Old Diamond School House just north of Ladysmith. We took possession of the building on December 1st 2003. At that time we already had 'A Very Sticky Christmas' in production at another venue. It was being produced under Lady Smith's Little Theatre though, but unfortunately we took possession just a little too late to move the production into our own building. With the help of several dedicated volunteers, Lady Smith's Little Theatre opened its doors to the public on May 12 2004 with our first production, Neil Simon's 'I Ought To Be In Pictures'. Murder', 'To B&B or Not to B&B', 'Of The Fields Lately', the award winning productions of 'The Long & The Short & The Tall,' and The Cemetery Club. 'The Gin Game' was another favourite, so was 'A Village Wooing' and 'Nasty Things Murders' and of course our last production 'The Butler Did It'. Now, here we are ready for change again. 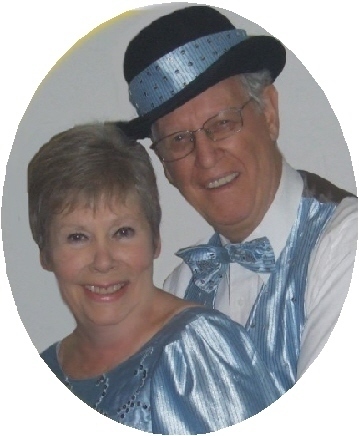 The long hours coupled with the fact that we also catered the dinner theatre side of Lady Smith's Little Theatre was taking it's toll and so the decision was made to retire, especially as we were getting requests to perform at other venues outside of the theatre. A Wench & A Bloke are going back on the road. For as long as we are able, we shall continue to do 'A Very Sticky Christmas,' and of course 'Bless'em All' our World War Two tribute show. We have been doing this show since the 80's and it continues to draw a full house. age, but hey! we still feel young and that's what it's all about. Onwards and Upwards!